Just got back to work after my first appointment at Seattle Smiles and am very happy with the experience, from their front desk staff on back! 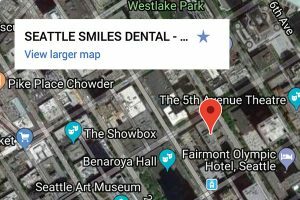 I’d delayed going to the dentist for 5+ months after moving to Seattle, just because I was hesitant about starting with a new dentist with just Yelp to guide me. However, I’m glad I did! Alison was my dental assistant and I honestly enjoyed my time with her! Did a great job cleaning my teeth and explaining things as we went, including what each tool was for and how it would be used, which I’ve never had a dentist do before! She also did a great job reading my x-rays–Dr. Nguyen confirmed all of her diagnoses (need to have some childhood fillings replaced). Dr. Nguyen was also great–very friendly and professional and clearly explained what needed to be done. Even the billing was explained very clearly! By the time I left, they’d already printed out an estimate for my specific costs for my fillings, given my insurance benefits. To top it off, the office has a great view of the sound, so you get a beautiful view from the chairs while they’re working on you! I came in for a cleaning last week and received the most thorough cleaning of my life. I knew I had plenty of stains between all of my teeth. When I got home I stood in front of the mirror and marveled. I couldn’t see a spot anywhere! My teeth have never been cleaner in my life. I was so thrilled I called the office back to get the name of the young woman who did such a great job so I could mention her by name. Thank you Ashley! I would strongly recommended her and everyone else at Seattle Smiles to anyone. Dr. Nguyen is very thorough in her examination and explains every step. You will feel more educated and happy about your smile. The staff is nice. The office is clean and has a wonderful view of the water. Their technology is not as high tech as others – no TV or TV to watch your dentist in action. However, you are armed and educated about your teeth. So happy I found this place! I’ve had dentists in the past who were personable but didn’t do great work. I’ve also had dentists who weren’t personable but did great work. Thankfully, Dr. Nguyen is personable AND does great work! She actually takes the time to explain things to you and always asks if you have any questions. I had the misfortune of needing six filings replaced, but Dr. Nguyen had printed a helpful diagram to show me exactly which teeth had what problems. I never felt like she was in a rush with me, which is a huge bonus these days. Top notch – thanks yelpers! I had my first visit with Dr. Nguyen today. What a fantastic experience! She was very thorough yet also very gentle. She was great to talk with, she explained everything very thoroughly and made sure that I was comfortable. As an unexpected bonus, she even taught me a new way to floss. My teeth look and feel great. Dr. Nguyen was my dentist for several years when she worked in Minneapolis. She was by far the best dentist that I’ve had. She is very upbeat and professional and talks you through things as she works on you, which I always appreciate. She works quickly and efficiently keeping your comfort in mind. Furthermore, she has proven to be an extremely bright, honest, genuine and interesting individual. Go see her. She’ll take good care of you. This place is great. Dr. Nguyen has a great bedside (chairside?) manner; she is friendly and easy to connect with, but also professional and extremely knowledgeable about teeth. She really takes the time to go through everything she is seeing about your teeth with you; looking at x-rays and pictures with you, and clearly explaining what she sees. Any extra treatment (fillings, etc.) she recommends clearly explains why she thinks it is something you should do; she doesn’t seem to recommend unnecessary things to do. The dental hygienist, Alison, is kind and exudes a sense of calmness and peacefulness. She made me laugh multiple times while she skillfully cleaned my teeth. Also, the office coordinator/person who takes care of insurance, Marilyn, is awesome. She totally knows her stuff about insurance and really makes sure everything gets billed properly. Having had a lot of mistakes made with insurance billing, I really appreciate this! She also let me know exactly how insurance would pay for a filling, and how they were going to go about billing it, which I really appreciated. Finally, their office has an awesome view of the Puget Sound and the Olympic mountains. Can’t think of a better place to be for a dentist! And they’re easily accessible by bus from the transit tunnels. I’m really happy with this place as my regular dentist. I’ve gone here a couple times now. Dr. Nguyen is very passionate about her work and takes the time to explain what I need to know about my teeth. She is very intelligent and takes genuine care of her patients (she is the owner after all). Her hygienists are also very warm and took great care of my teeth. I thought it was nice that they have the same hygienist clean your teeth from your previous visit so I didn’t feel like another patient. The place is very clean and has a nice view too. I hate going to the dentist but they made it a pleasant experience. I’ve been going to Dr. Nguyen long enough now and had enough work done to provide an informed opinion. Bottom line is I would have no problem what so ever recommending her to a friend. I’ve been very pleased with the professionalism, efficiency and friendliness of Dr. Nguyen and her staff. I’ve never reviewed a health care provider before, but I’m inspired to write since I’ve been very pleased with my dental care from Dr. Jenny Nguyen. I’ve visited the office for two regular cleanings and two fillings. She is very careful to explain everything her and her staff are doing to make sure I feel comfortable and understand the processes. She taught me how to properly floss and angle my toothbrush – these small things have made a big difference in how my teeth and gums feel day-to-day. Highly recommend her if you need care in the downtown Seattle area. Dr. Nguyen is amazing! I have had a long fear of dentists and when I had an emergency I explained that to her. She took the time to explain things with me and made me really comfortable. She does so in a way that makes me feel good. The staff are also amazing and I love the personalized experience! Highly recommend to anyone! Best experience I’ve ever had at a dentist office. Staff was friendly and Dr. Jenny Nguyen made me feel relaxed and I felt like she was well educated and knew the best practices. My dentist of 30 years retired and I was not looking forward to getting accustomed to a new dentist. Dr. Nguyen took over his practice, and my first visit was wonderful. She reviewed my medical and dental history, did an exam and even performed the routine cleaning and polishing herself, which made me feel like she had a thorough understanding of what’s up in my mouth. She also answered my questions fully, and provided the information I needed to decide on some future possible treatments.